My daughter and I love to make these delicious muffins—we'd eat them nice and warm, fresh from the oven! This recipe is a family treasure! We make them using a gluten-free flour blend and they turn out more dense, but wonderful. Preheat oven to 400°. In a large bowl, combine flour, sugar, baking powder and salt. In a small bowl, combine egg, milk, butter and honey. Stir into dry ingredients just until moistened. Fill greased or paper-lined muffin cups three-fourths full. Bake 15-18 minutes or until a toothpick inserted in center comes out clean. Cool 5 minutes before removing from pan to a wire rack. Serve warm. Freeze option: Freeze cooled muffins in resealable plastic freezer bags. 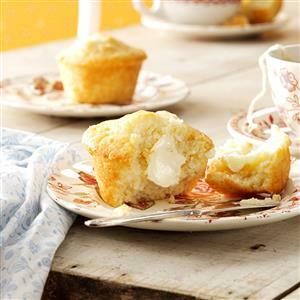 To use, thaw at room temperature or, if desired, microwave each muffin on high for 20-30 seconds or until heated through. Yield: 1 dozen. A Cooking Technique to Flip Over! The Food Is Fun With This One- It’s Not A Trap! SO Many Ways to Use Feta! What the Pros Know About Lemons that You Should, Too! Toddlers First Taste of Bacon!